Saturday, June 10th was my parents’ 51st anniversary. I am grateful to them for so many things, but especially for the wonderful examples they’ve been as parents and partners. Fifty-one years is an unimaginable time to look at the same face every day, but they make it seem effortless. This year, I brought over a bottle of Prosecco for mimosas so we could toast to the next 51 years. Last year, however, was the BIG celebration. They booked a cruise for the whole family (eleven of us in total) on the Disney Dream. Since summertime is such a crazy time with all of the kids’ different school schedules, we chose to go for a New Year’s trip when everyone was off for Christmas break. That meant we had plenty of time to read blogs, watch videos, and prepare for the trip beforehand. One of the things we learned was that EVERYONE decorates their cabin door. I knew I wanted to do a special 50th anniversary edition for my parents. Of course, I waited till the last minute to do anything—like the day before we drove to Port Canaveral. While I had the Cricut out anyway, I figured I’d make a t-shirt for Alice to wear. One turned into several with leggings to match. I can't stop myself. You know we Southerners will monogram anything that’s not nailed down. Being Disney themed, I made hers with Minnie ears. 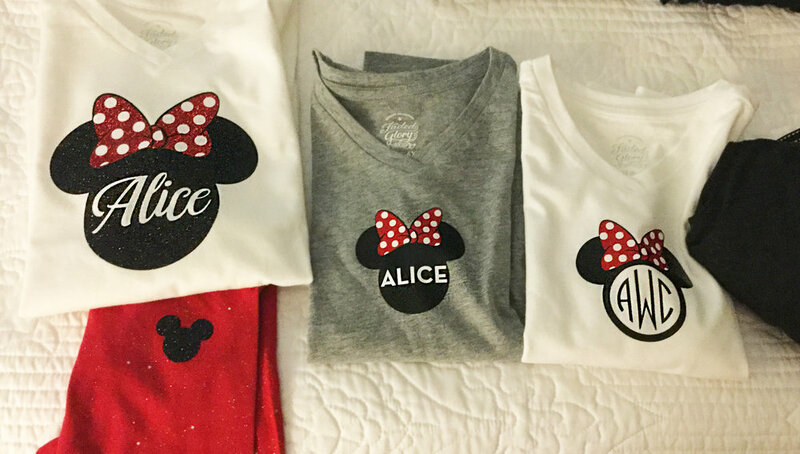 I think Alice liked her shirts... especially when paired with a sparkly, twirly tutu.